PHOTO BY JOHN SCHLIA Duck Tacos at The Revelry. Tuesday-Thursday: 11:30 a.m. to midnight; Friday: 11:30 a.m. to 2 a.m.; Saturday: 4 p.m. to 2 a.m.; Sunday: 11:30 a.m. to midnight. When The Revelry opened last year, it introduced many to low-country Southern cuisine and added another local option for craft cocktails. It also enjoyed a lot of buzz: some positive (quality food and drinks, attractive interior), some negative (over-priced, hipster mecca). One year in, the buzz has quieted but the quality hasn't. Across the board — an inventive bar, tasty food, transportive decor and attentive service — The Revelry is worth your time. A few words about the most common criticisms I've come across: while it's fair to say The Revelry is not an inexpensive restaurant, its pricing is on par with local restaurants in its service category. Cocktails at The Revelry are $10, similar to those served at The Daily Refresher, Nikko, and Good Luck. Entrées on the spring menu range from $16 to $27: on par with entrees at Lento, Max of Eastman Place, and TRATA. As for The Revelry being a hipster magnet: are there any bars or restaurants serving craft cocktails without their share of tattooed, mustachioed, under-30 clientele? I'm poking fun but The Revelry's bar really is impressive — both the actual structure glittering with bottles; and the menu, mixing all manner of spirits with various tinctures. 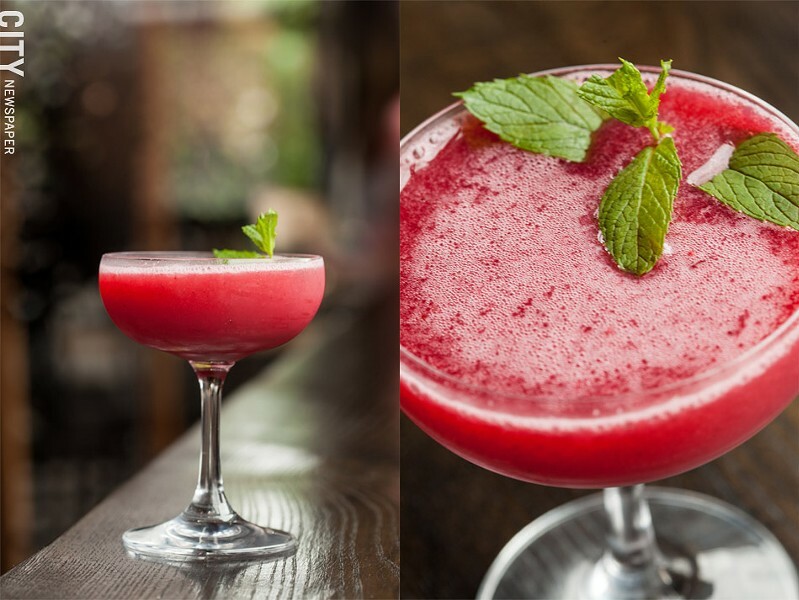 The Revelry features a lengthy craft cocktail list, including the Muay Thai Mule. The Jalisco Sour ($10) blends silver tequila, lime and pineapple juices, and angostura bitters into a light and restrained drink. Served in a wide-mouth champagne glass with a fluff of whipped egg white at the top, it wouldn't look out of place at ladies' luncheon. Its appearance belies its strength: it is the steel magnolia of cocktails. 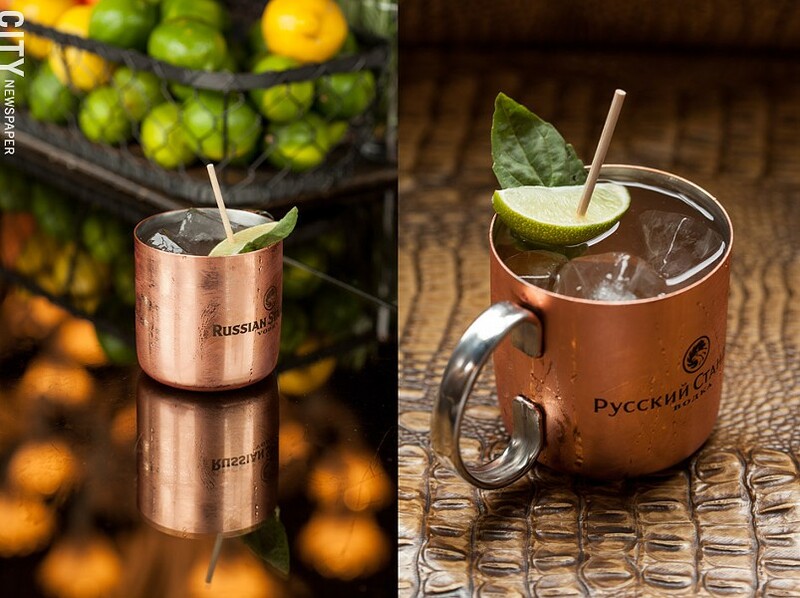 The Muay Thai Mule ($10) moves the mule out of Moscow by mixing ginger beer and vodka with a shrub, a combination of Thai basil, strawberries, sugar, and vinegar. It's refreshing, mildly sweet with an herbal edge, and goes down easy. The Revelry's food menu puts similar twists on the familiar. Beet deviled eggs ($7) shine jewel-like on the platter — an impressive feat for a dish commonly served at church dinners. Served on a white rectangular plate, four half eggs stand tall, a deep ruby-purple in hue, barely containing the golden yolk filling piled inside. Each is garnished with mustard seeds, chips of bacon and micro greens. Though there are slices of Chioggia beets on the plate, the deviled eggs aren't earthy. They taste rich, salty and creamy, with added mustard and bacon kicks. 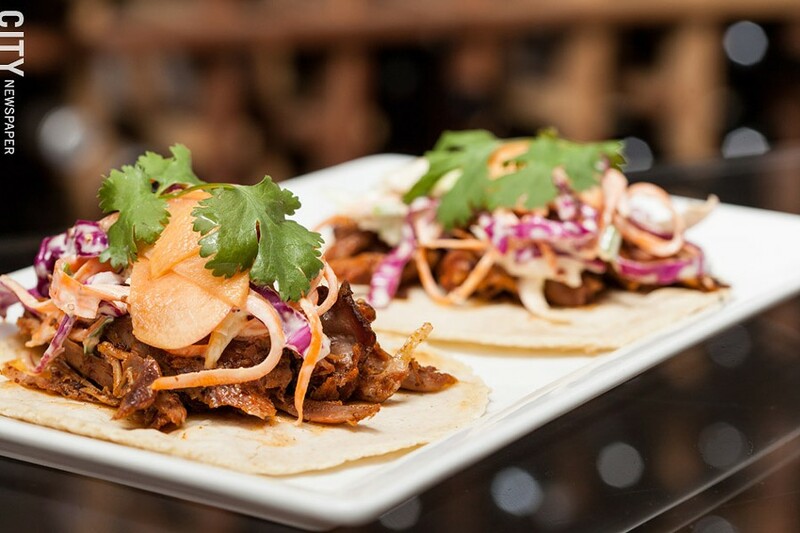 The Revelry features a seasonally changing food menu – with Duck Tacos on the spring menu. A few of the appetizers would satisfy as a light lunch, including the duck tacos ($10). They start with house-made corn tortillas, pressed until they have irregular edges, a gentle thickness and a slight chew, and are cooked until the pale corn dough is lightly freckled with spots of brown. The duck — pulled apart the way you might prep barbecued pork — is tender and coated with deep, reddish-brown pickled peach relish that's smoky, sweet, and spicy. There's a pleasing vinegary sharp bite, too. Included on the starter menu are a "basket of biscuits" ($5). This Southern staple comes with five biscuits and two ramekins, one with smoked butter and the other with "Edna's" pimento cheese spread, another traditional Southern offering. The biscuits are golden on top, paler on the sides, and flaky. They are drier than I like, and benefit from the fat and cream of the spreads. The pimento cheese is pale orange, creamy, salty, and a little spicy — the kind of treat that makes it easy to spoil your appetite. The butter is a different story: served chilled, it's difficult to taste its smoke or spread it on the biscuit. Nitpicky? I don't think so. This is an appetizer with basic elements -- and it's surprising The Revelry missed the simple detail of serving butter at room temperature. 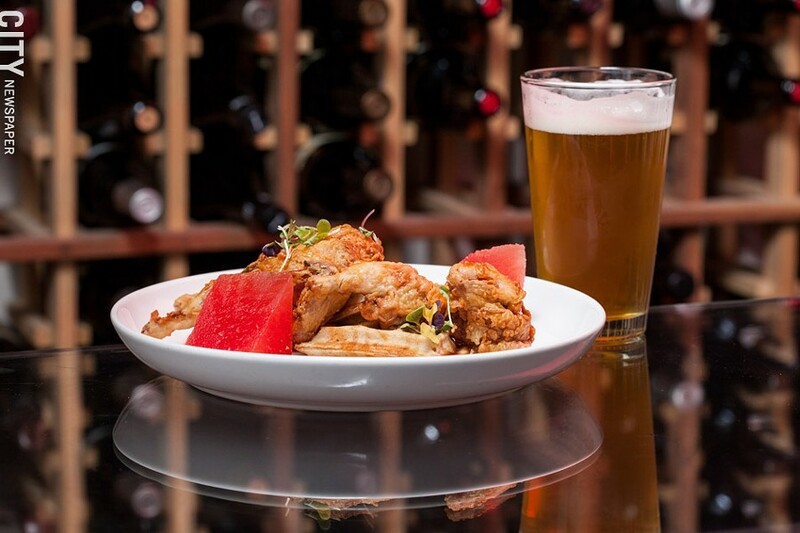 Country Fried Quail and a beer from The Revelry. The country fried quail ($24) entree, however, makes no missteps. In a spin on chicken and waffles, one and a half breaded and fried quails arrive plated on two triangles of black garlic waffles. The quail is delicious, with a flavorful, crinkly-crisp crust drizzled with honey and hot sauce. Crisp on the outside and tender within, the waffle is both sweet and garlicky. Even the compressed watermelon garnish is impressive. It enhances all the qualities of watermelon that are so appealing: its color (a vibrant, deep pink), its flavor (intense and summery), and its texture (crisp yet yielding). The sugared and spiced dry-aged duck breast ($27) dish plays with contrasts. The duck is tender and delicate in flavor, almost milky. Its rub gives the duck a sweet and spicy kick. Underneath is a mound of creamy grits; pickled cranberries burst on the tongue with bracing tartness. Non-fowl dinner choices include a lamb shank ($26), eggplant with risotto ($16), and The Revelry cheeseburger ($16). The Vega cocktail at The Revelry. In both the decor and service, The Revelry provides genteel hospitality. The staff go out of their way to make sure your experience is a good one, and do so seemingly effortlessly. The interior is one of the most attractive restaurant spaces in the city, evoking casually upscale plantation house without falling into kitsch. Replete with soft black, soft white, and bittersweet chocolate tones, with polished woods, crystal chandeliers and exposed ductwork, it's a thoughtful blend of high and low — a style that's reflected on the menu. Note that The Revelry's menu changes to reflect the seasons. The new summer food and cocktail menus were scheduled to launch July 8, so items mentioned here may have been rotated out for new options. Either way, there will be something interesting to fill your glass, your plate, and your stomach. Share your food and restaurant tips with Laura Rebecca Kenyon on Twitter at @LauraKenyon, or email at Food@rochester-citynews.com.